Read the pages, find the links. Generally, you just unzip the file and run the launch.bat file. You can configure the properties and config files if you know what you're doing. You can change launch.bat to adjust memory settings. And you'll want the latest Java update installed (for best performance on a 64-bit machine, be sure to have 64-bit Java). I'm sure you're wanting to get this going today, and unfortunately I have to work in about 10 minutes. If you are still having troubles tomorrow I'd love to help out! ill be on late tonight and tomorrow morning. I'll pm you my skype name. Once you extract everything, run it once and let the DOS window scroll through all the downloads and various installs/messages. Don't be worried about error messages, as there are typically a lot of those no matter what you do (it's all related to how mods interact and doesn't necessarily cause a break). Once it seems to stabilize and nothing more is showing up, type STOP to stop the server and press Enter. The config files don't need to be changed. But as you get used to managing a server you may want to enable or disable specific features of mods, and that's where you would do it. 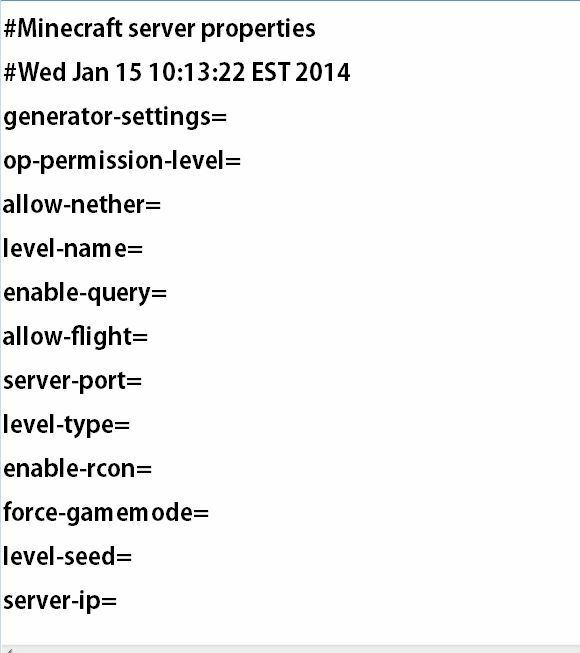 Even if you're just curious, it's pretty educational to see all the info mentioned in the config files. After you've edited the properties as you choose, then restart the server. You might even be able to edit the properties before running the server once... I just don't recall if it shows up first or not. Here's mine, straight out of the file. But it should all be configured for you as part of the download, unless you know you want to change something I'd leave it alone. The only one that I'd suggest changing is the level-name, just to make it a name you want for your world. You don't need to enter a server IP usually. ok i did it all how do i know the ip? so how do I connect to it? Right so in your server properties it will say something like "server-ip= " In that spot you need to put the internal ip that your computer connects to in your LAN (Local Area Network.) Here is how you find it in windows. Hit the Win button and R at the same time. Type in "cmd" and press enter. Then when it brings up the command prompt, type in "ipconfig" Your looking for your IPv4 it should look something like this 192.168.0.X. Put that value into the config file for your server as such "server-ip=192.168.1.X" After you do this the next step will be to set up Port Forwarding, You should be able to connect to your server now by one of these ways. In MC where its says server IP put in "192.168.1.X" or "192.168.1.X:25565" or "localhost" or "127.0.0.1" one of these will allow you to connect. For a friend to join using this method it will have to be on your LAN. If they are some where else connecting you will have to set up Port Forwarding which once again I'd be happy to help with. Let me know if you have questions. You shouldn't even need to fill out that field. People connecting to a server need to know either the internal IP of that computer (if they're on your LAN) or the external IP of your router (if they're connecting via the web). If you're playing on LAN then you need to figure out your computer's IP... check your router or open a DOS prompt and type 'ipconfig' to get a readout. If you want someone to connect from the web then you'll need the external IP by logging into your router -- and you'll need to set up port forwarding. If this is getting too complicated for you, you might want to do more reading on IP addresses and port forwarding.